Anopheles stephensi is a primary mosquito vector of malaria in urban India and is included in the same subgenus as Anopheles gambiae, the primary malaria vector in Africa. A. gambiae consists of a complex of morphologically identical species of mosquitoes, along with all other major malaria vectors, however, A. stephensi has not yet been included in any of these complexes. Nevertheless, two races of A. stephensi exist based on differences in egg dimensions and the number of ridges on the eggs: A. stephensi stephensi sensu stricto, the type form, is a competent malaria vector that takes place in urban areas, and A. stephensi mysorensis, the variety form, exists in rural areas and exhibits considerable zoophilic behaviour, making it a poor malaria vector. However, A. stephensi mysorensis is a detrimental vector in Iran. An intermediate form also exists in rural communities and peri-urban areas, though its vector status is unknown. About 12% of malaria cases in India are due to A. stephensi. In November 2015 an American research group demonstrated that an Anopheles stephensi with genetic modifications could be rendered incapable of transmitting malaria, and that 99.5 percent of the mutant mosquitoes' offspring were also immune. In rural areas, the larvae of A. stephensi may exist in many aquatic habitats, such as: ponds, streams, swamps, marshes, and other sources of standing water. They may also occupy smaller environments, such as: tree holes, leaf axils, and man-made containers. Though larvae of A. stephensi mysorensis exclusively prefer to occupy stone pots and earthenware containers. This species is also able to endure high amounts of salinity, and have been found to breed readily in water where the salinity is equal to or even surpassing that of sea water. Furthermore, A. stephensi breeds in a number of different water-bodies in urban areas, but predominantly in artificial containers, walls, overhead tanks, and ground level water tanks. Most larvae feed on microorganisms and particle matter that is suspended in water. However, later in development, adult males will feed on the nectar of flowers, whereas females will take blood meals, which help produce viable eggs. A. stephensi is a sub-tropical species that predominates in the Indian subcontinent (except Nepal and Sri Lanka) and is also distributed across the Middle East and South Asia region, existing in countries such as: Afghanistan, Bahrain, Bangladesh, China, Egypt, India, Iran, Iraq, Oman, Pakistan, Saudi Arabia, and Thailand. A. stephensi is considered to be endophilic and endophagic, regardless that it may feed outdoors during the summer months when it is warmer and humans and animals are more likely to sleep outside in the open air. Although, indoor feeding habits have shown no variation between seasons, adult females tend to feed more often at night during the summer months rather than during the day in winter. A. stephensi shows an increased preference for humans rather animals in urban areas, where they can be found year round. A. stephensi is an important vector for the human malaria species Plasmodium falciparum. ↑ Valenzuela, J.G., Francischetti, I.M.B., Pham, V.M., Garfield, M.K., & Ribeiro, J.M.C. (2003). Exploring the salivary gland transcriptome and proteome of the Anopheles stephensi mosquito. Insect Biochemistry and Molecular Biology, 33, 717-732. 1 2 Dash, A.P., Adak, T., Raghavendra, K., & Singh, O.P. (2007). The biology and control of malaria vectors in India. Current Science, 92, 1571-1578. 1 2 3 Malhotra, P.R., Jatav, C.P., & Chauhan, R.S. (2000). Surface morphology of the egg of Anopheles stephensi stephensi sensu stricto (Diptera, Culicidae). Italian Journal of Zoology, 62, 147-151. 1 2 3 4 5 Sinka, M.E., Bangs, M.J., Manguin, S., Chareonviriyaphap, T., Patil, A.P., Temperley, W.H., Gething, P. W., Elyazar, I.R.F., Kabaria, C.W., Harbach, R.E., & Hay, S.I. (2011). The dominant Anopheles vectors of human malaria in the Asia-Pacific region: occurrence data, distribution maps and bionomic précis. Parasites and Vectors, 4, 1-46. ↑ Tikar, S.N., Mendki, M.J., Sharma, A.K., Sukumaran, D., Veer, V., Prakash, S., & Parashar. B.D. (2011). Resistance status of the malaria vector mosquitoes, Anopheles stephensi and Anopheles subpictus towards adulticides and larvicides in arid ad semi-arid areas of India. Journal of Insect Science, 11, 1-10. ↑ Rueda, L.M. (2008). Global diversity of mosquitoes (Insecta: Diptera: Culicidae). Hydrobiologia, 595, 477-487. 1 2 Harbach, R.E. (2007). The Culicidae (Diptera): a review of taxonomy, classification and phylogeny. Zootaxa, 1668, 591-629. 1 2 Maouchehri, A.V., Javadian, E., Eshghy, N., & Motabar, M. (1976). Ecology of Anopheles stephensi Liston in southern Iran. Tropical and Geographical Medicine, 28, 228-232. ↑ Jeyabalan, D., Arul, N., Thangamathi, P. (2003). 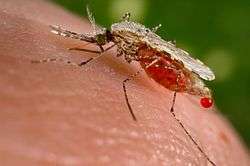 Studies on effects of Pelargonium citrosa leaf extracts on malarial vector, Anopheles stephensi Liston. Bioresource Technology, 89, 185-189.